This post has 542 views. Ever since I started watching anime regularly (again) a couple of years ago, I’ve mostly watched new series, but starting a few months ago I’ve been trying to watch some older “classics” just to broaden my horizons and see what makes these series stand out for people. Watching completed series is also a good way to be entertained since I don’t have (or rather don’t want to pay for) cable TV at my apartment. I started with Cowboy Bebop, which is closer to my comfort zone since I like sci-fi and action. I recently finished watching all 26 episodes of the show and the theatrical feature Knockin’ on Heaven’s Door, and thus here are some thoughts I have on Cowboy Bebop as a whole. Produced by Sunrise with the original from 1998 to 1999, Cowboy Bebop is a 26 episode anime series set in the near future where Earth is left as a wasteland after a catastrophic accident and humans have colonized the solar system. 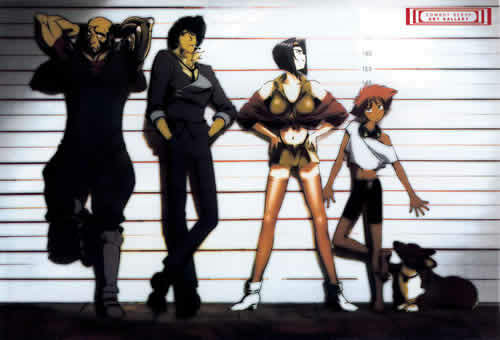 The series follows a group of bounty hunters (known as “cowboys” in the series) on the spaceship Bebop and features their adventures to capture bounties as well as each member’s attempts to deal with their complicated pasts. The movie Knockin’ on Heaven’s Door was released in 2001 and features a story that takes place in the middle of the series’ time line. Cowboy Bebop was an entertaining series, especially for a sci-fi and action fan like me. The first thing to note about the show is its excellent production quality. The animation is very good for something from late 90s, and the action is fast, fluid and not afraid to be bloody like what you’d expect from a show about bounty hunters. And of course there was the emphasis on music, and the compositions from Yoko Kanno really helps set the mood of an episode and differentiate one episode from the next. Other than the excellent production quality, Cowboy Bebop has very good storytelling. The series is composed of mostly unrelated adventures of the main characters, but over the course the show the main characters are developed as their backgrounds are slowly pieced together. Due to the disconnected nature of the episodes, the mood often changes quickly from episode to episode, but overall Cowboy Bebop has a good balance between the action, dramatic, and comedic elements. There is actually pretty decent comedy in this show especially in regards to how the Bebop crew never seem to cash in on big bounties. On the other hand, the muddied pasts of Spike, Faye and Jet can quickly bring a serious and dramatic mood to the show. As for the main characters, they are an odd combination but they are a likable bunch. All of them have very different backgrounds and personalities, and at least three of them are burdened by their pasts, but Cowboy Bebop managed to bring them together into a (somewhat dysfunctional) family of sorts. There are plenty of squabbles and the characters don’t like to admit that they care for each other, but it’s clear from watching their actions that they grow together and also grow apart and thus it’s easier to relate to them. For me, the thing that stood out the most about Cowboy Bebop was how consistently good it was. There wasn’t any “Wow! This is Awesome!” moment in the show, but every single episode was of high quality and there wasn’t anything that was remotely dull. Even in other series that I consider to be excellent, there are just some episodes (usually for setting up the next period in the show) which seem slower than the others, but I did not notice this in Cowboy Bebop. This partly has to do with how the series is structured as individual sessions as opposed to a continuous story or story arcs, but perhaps it’s perhaps even more impressive that the show was able to maintain its quality with 20+ different short stories. Compared to the main series, I didn’t think the movie was as good. Knockin’ on Heaven’s Door was still a good movie, but it was basically a lengthened Cowboy Bebop episode with about the same level of excitement, and thus it felt a bit slower than the series because it took longer to set things up and deliver the conclusion. Blame my short attention span. After watching the series and the movie, I now understand why Cowboy Bebop is so highly regarded by many. It’s a show that’s consistently excellent in almost all elements. Definitely recommended for those who like sci-fi and action.